HomeSpanish CourseThe direct object spanish explained with examples and exercises 51. 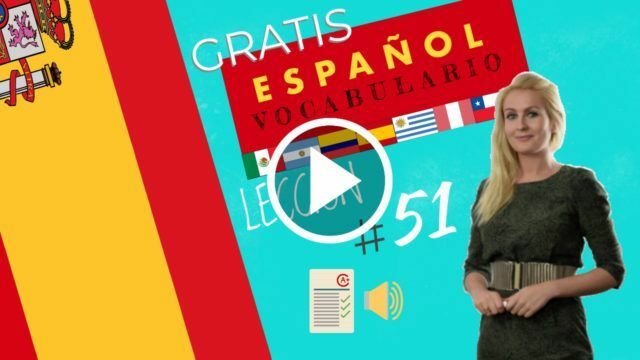 July 19, 2018 julia Spanish Course Comments Off on The direct object spanish explained with examples and exercises 51. What is the direct object? In this sentence, “cheese” is the direct object because it receives the action of the verb “eat”. The Sales are on. In many stores there are very interesting offers. Alba wants to take advantage of the occasion to acquire some clothes.She talks to Esteban and finally convinces him to go shopping. -Esteban: You will not convince me! I’m not interested in buying clothes. It bores me to go from store to store to try stuff on and look at myself in the mirror to see if I’m handsome with it on. -Alba: Esteban, you need to freshen up your wardrobe. It’s very outdated. Your wardrobe is screaming for a change. Esteban: I must admit that I’ve been wearing the same clothes for five years. Why change it if I like it? -Alba: Did you notice those grey pants that you wear?They’re ripped! They are from the year “way back when”. With that look, you will not successfully flirt. The girls will not look at you. This last argument of Alba seems to definitely convince Esteban, who finally accompanies her to go shopping. Alba knows a lot about fashion and can advise Esteban. Esteban listens to these tips and appreciates them gratefully. In return, he has to arm himself with patience accompanying her and seeing how she tries thousands of clothes. -Esteban: I see it and I do not believe it. Once again that pink skirt? But you’ve seen it a thousand times already. -Alba: It’s not for me. I’m going to give it to a very special friend. Her name is Marta. You know her, right? Esteban: Of course I know her. I remember seeing her for the first time at a party and I invited her to a boxing match, but she rejected me. -Alba: You invited her to a boxing match? What a weird way to start a conversation! I see that you not only need stylistic advice. -Esteban: So nice of you! By the way, have you already bought everything you had to buy? Oh, now I remember that I must buy socks! I need them because the last ones I bought were so cheap that they broke right away. Alba and Esteban spend all afternoon entering and leaving the locker rooms of the clothing stores. Esteban has bought three red sweaters, two blue shirts, three white underpants and two pairs of black socks. Alba has bought a violet blouse, a yellow shirt and underwear. 3 / Grammar:The direct object Spanish. The direct object answers the question “what?” Or “to whom?” Regarding what the subject of the sentence is doing. We often replace the name of the direct object with a pronoun, as demonstrated in the following examples. In an affirmative sentence with a verb, the direct object pronoun comes immediately before the conjugated verb. The pronoun (it) comes immediately before the verb (eat). Note: A change in the subject does not affect the direct pronoun of the object. Similarly, if the direct object of the sentence changes from singular to plural, the plural pronoun must be used. Maria the baby (the lemonade). I do not sell the computer. Compare the following affirmative statements with their negative counterparts. The students listen to me. The students do not listen to me. When a sentence has two verbs, the first verb is conjugated and the second verb remains in the form of an infinitive. In sentences with two verbs, there are two options with respect to the location of the direct object pronoun. Place it immediately before the conjugated verb. Attach it directly to the infinitive. Here are the two methods side by side. None of the methods is “better” and both are used equally. We must not do it. I need to buy a kilo of fruits. 1- What does Alba want to do in the sales? Alba wants to take advantage to acquire some clothes. 2- Why does not Esteban want to go shopping? He is not interested in buying clothes. Bores you go from shop to shop to test and look at yourself in the mirror to see if he is handsome with it. 3- What does Alba think about Esteban’s wardrobe? Alba thinks that Esteban needs to renew the wardrobe. It’s very old-fashioned. 4- What’s happened to the pants Esteban wears? The pants are broken, they are from years ago. 5- What does Alba think will happen to Esteban if he wears those pants? Alba thinks that if he were wearing those pants he will not flirt and the girls will not look at him. 6- What does Esteban do when Alba advises him? Esteban listens to the tips gratefully. 7- What does Esteban have to do in exchange for these tips? In return, he has to arm himself with patience accompanying her and seeing how she tries thousands of clothes. 8- Why is Alba looking at a pink skirt so much? Because Alba wants to give it to her special friend, Marta. 9- Where did Esteban meet Marta and what did he do? He met her at a party and invited her to a boxing match, but she refused. 10- What did Esteban and Alba finally buy? Esteban bought three red sweaters, two blue shirts, three white underpants and two pairs of black socks. Alba bought a violet blouse, a yellow shirt and underwear.